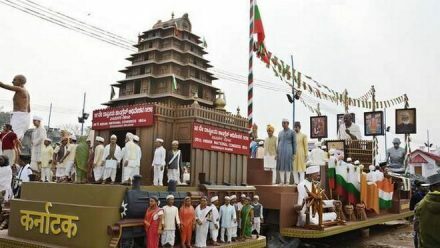 A tableau depicting the Belagavi Congress session of 1924 will represent Karnataka at the Republic Day parade this year in New Delhi. The 1924 Congress session held on December 26 and 27 is unique as it was the only session that was chaired by Mahatma Gandhi. Basavaraj Kambi, Deputy Director, Information and Public Relations, said the Defence Ministry had given the theme of Mahatma Gandhi for all tableaux this year to mark the Mahatma’s 150th birth anniversary. Karnataka’s tableau was one of the 17 selected. This is the 10 consecutive year that the State has been selected for the R-Day parade. Art Director Shashidhara Adapa, who created the tableau, said extensive research had gone into its design. “We are recreating the stage of the Belagavi session. The main stage was called Vijayanagar and a well was dug up to supply water to the attendees and named Pampa Sarovara. In fact, the well continues to be a source of water in Belagavi to this day,” he said. This was also the first session where the process of designing a national flag began and this would also be depicted. Kannada poet Huilgol Narayana Rao wrote his famous poem ‘Udayavagali Namma Cheluva Kannada Nadu’ in praise of a Kannada state. Musician Praveen D. Rao has composed the song which would be rendered at the event, officials said.